A square club face is key to curing a slice. Trying to cure a golf slice without working at it is almost like trying to avoid a car accident while driving with your eyes closed – you might get lucky a time or two, but ultimately the inevitable will happen. It is almost natural for a beginning golfer to have a slice in his shot. Although the slice can be avoided, it takes work to adjust the swing in the proper way to ensure that the slice is removed. Do not simply turn your body to the left and hope that this will compensate for the slice. This is only a very temporary fix, and not a very good one at that. By facing toward the left, some golfers hope that the ball will ultimately slice its way to the fairway. This requires a large amount of guess work and does nothing to help the swing. It is best to be committed to work on the swing, even if it is awkward at first. Stand in a position in which your feet are shoulder-width apart. There should be an imaginary line that vertically connects your shoulders and your feet on the same plane. 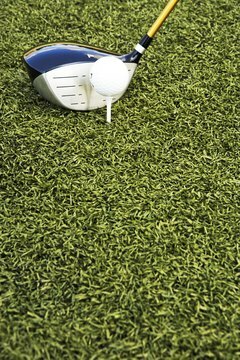 Properly swinging a golf club requires a certain amount of rigidity; however, do not get too tight. Simply swing a few times from this position before you step up to strike the ball. Approach the ball and swing. In order to change the way your club hits the ball, the backswing must be altered. Typically, those who slice golf balls are those who reach the pinnacle of their swing with their hands just next to their heads or even slightly above their heads. To avoid a slice, swing so that your hands go to the area just behind your shoulder on the backswing. This will put the club in the proper position as you prepare to strike the ball. Keep the wrists straight. Wrists that move a lot make it more difficult to hit a shot straight. During the backswing, the wrists must stay in the same position. Swing through the ball and imagine there is another ball 3 inches in front of the one you hit. Follow through so that your club would hit the imaginary golf ball as well. This will keep you from your natural movement that causes golfers to slice shots.